Dimensions 1 by 8.50 by 1.75 in. Salkindâs Exploring Research, 8th edition makes research methods accessible for students. Personalize Learning - MySearchLab delivers proven results in helping students succeed, provides engaging experiences that personalize learning, and comes from a trusted partner with educational expertise and a deep commitment to helping students and instructors achieve their goals. Improve Critical Thinking â âWhat Youâll Learn about in This Chapterâ helps students organize and understand the material to be covered within the chapter.Â âExercisesâ and âTest Yourselfâ sections challenge students think about and discuss chapter topics and improve their problem-solving skills. Resources in the text and online help students master the process of writing a research paper. Engage Students â Chapter objectives, chapter quizzes, Lab Manual, and eText within MySearchLab help to engage students in the material. Support Instructors â MyTest, PowerPoints, and an instructorâs manual offer additional support for instructors. About: ALERT: Before you purchase, check with your instructor or review your course syllabus to ensure that you select the correct ISBN. About: Presents the basics of research in the social and behavioral sciences in an informative and student-friendly way. About: The 7th edition of Exploring Research provides an introduction to research methods in a friendly, approachable writing style. About: Book by Salkind, Neil J. 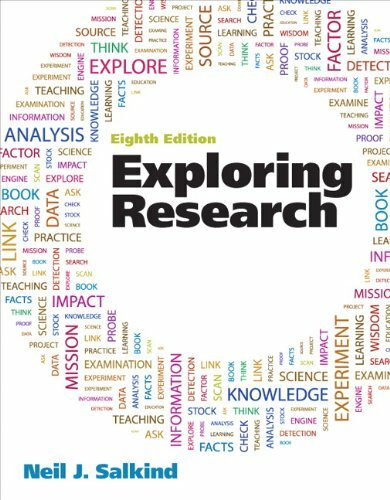 About: The 6th edition of Exploring Research provides an introduction to research methods in a friendly, approachable writing style. About: The fourth edition of Exploring Research provides an introduction to research methods in a friendly, approachable writing style. About: This text provides students with a basic introduction to research methods in the social and behavioural sciences. About: "A new, more explicit organization of the section on research design, now divided into experimental, non-experimental, and quasi - experimental designs" Very Interesting! About: Salkind's clear, straightforward writing makes this introduction to research methods unusually accessible.